Lots of malty aroma, with a grainy and roasty character to it. I don’t pick up much in the way of hops or yeast esters. The beer is deep brown in gross examination. When held up to the light, a deep ruby tinge is quite apparent, as well as excellent clarity. It’s very pretty! The head is beige, fine, and moderately low, with excellent retention during the course of consumption. The beer is malt-forward, with a primarily grainy and chocolate character backed up by roasty notes (in the overall same ballpark as the aroma). The bitterness is moderate and smooth, but not overwhelming. The beer has a moderate body and a pleasant, fine carbonation with a slightly creamy sensation. The finish is relatively dry and tasty. Yes! For something that was thrown together from odds-and-ends, it turned out exceptionally well. Although I am unlikely to duplicate this exact recipe ever again, I think the overall ‘feel’ is a definite winner. 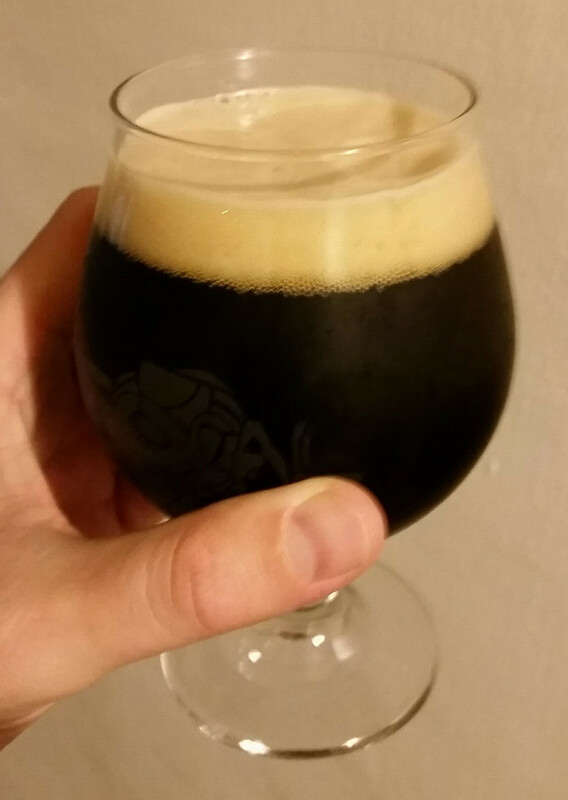 The beer is a solid improvement on my last porter, most probably in my choice of a less attenuative English ale yeast as well as a healthy addition of flaked oats, which added some needed body over the previous recipe. I would note that this probably is best classified as a “hybrid porter”–the starting gravity is a bit higher than conventional for an English porter and the graininess is apparently slightly out of character, but it’s not quite aggressive enough to be an American porter (no ‘burnt’ characteristics and the hops are fairly tame). Ignoring the BJCP, though, it’s a great beer! I would definitely brew a simplified version of the recipe (cut the micro-additions of various grain sample packs), or perhaps even switch it up by using Maris Otter for the base malt. This entry was posted in porter and tagged Packrat Porter, PP. Bookmark the permalink.